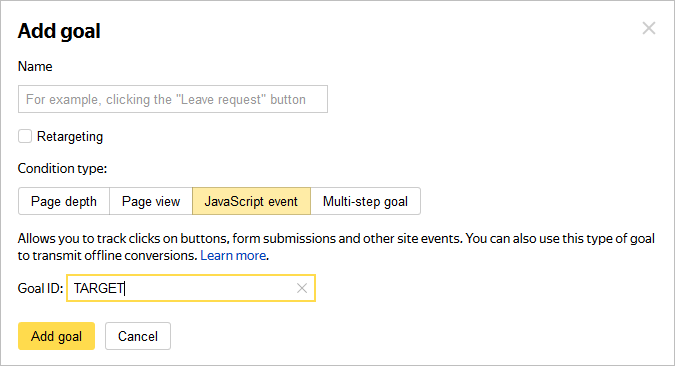 This type of goal lets you track events on a site (button clicks, form submissions, and other events) that occur without the page URL changing. If the URL changes, use the Page view type of goal. In E-commerce, use the goal_id field to transmit information about a conversion along with data about the action. Attention. Some users might complete the goal somewhere other than on the site, such as by making a phone call. To count these users, configure transmitting call tracker data to Yandex.Metrica. Then you can add calls to Yandex.Metrica reports and also use a special group of reports. When you create a goal, you set its identifier. When a goal is completed, the reachGoal method is called, and the specified ID is passed to it. Use identifiers that aren't contained in the site's page URLs. Otherwise, statistics will also include session information for those pages that contain the goal name in the URL. The following symbols are not allowed in goal identifiers: /, &, #, ?, =. Use the reachGoal method on site pages. XXXXXX is your tag ID. TARGET_NAME is the goal identifier. In the Yandex.Metrica interface, go to Settings → Goals and click Add goal. In the Name box, enter a name for the goal to create. Specify the ID of the goal. Click Add goal and save changes. Yandex.Metrica begins collecting statistics in just a few minutes after saving settings. A maximum of 200 goals can be set for each tag. The service registers a user completing the same goal on the same tag no more than once per second. During a single user session, the service can register up to 400 completions of all the goals created for the tag. If you edit the tag or a goal, all the previously collected information does not change. If you delete a goal, the information collected for it will not be available in reports. If you have questions about creating and configuring goals, contact the support service.